Go beyond the basics of screenwriting, forget all of the fancy vocabulary, and let's get your script finished! Receive immediate access to all lessons, lectures, and audio, and the material provided within this full development screenwriting course will help you build your script, one step at a time. This course allows you to work at your own pace and finish a script in less than 12 weeks! You can start and finish whenever you like. It's like purchasing an online instructional e-book with audio lectures, lessons, and assignments! 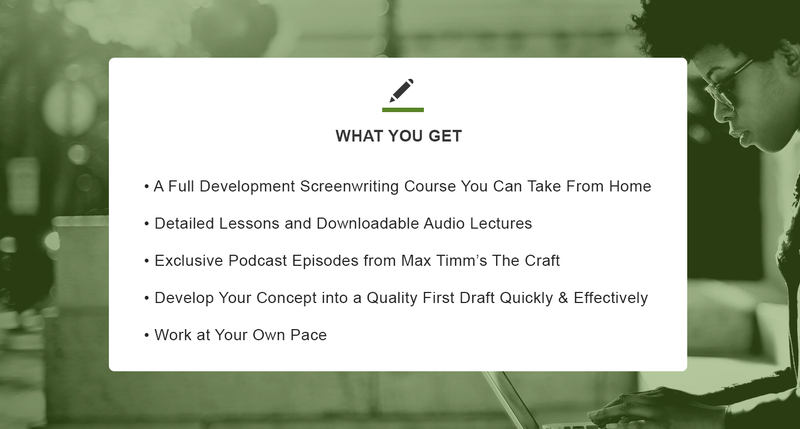 Presented as online version of the live Class and Workshop hosted by Max Timm in Los Angeles, this course was inspired by his popular writing podcast, The Craft, and will offer you exclusive podcast episodes only online class writers will receive. So jump in and get ready to write! With the amount of material that is covered in this course, you will not find a more inexpensive course on screenwriting that offers as much as The Craft Course. The International Screenwriters' Association takes pride in offering services to writers without breaking the bank. Take advantage of what is offered here and we promise you will come away with a stronger draft of your script had you tried to go this route alone. Looking for a course with instructor feedback? Interested in being evaluated for the ISA Development Slate? Check out the ISA's Development Slate Evaluation here. The Director of Education with the International Screenwriters’ Association, President of The Story Farm, and VP of Development for Creative Screenwriter Prods, Max has 15 years of experience in developing material and writers’ careers. His focus with the ISA is to build a creative community and bring ISA writers closer to ISA Industry Professionals. Having attended Holy Cross College at Notre Dame and then transferring to Columbia College Chicago to study screenwriting and producing, Max is a Midwesterner and Chicagoan at heart who prides himself on supporting creative people in as many ways possible. Recently he helped build a development slate with the ISA, submitting writers’ projects on their behalf and helping them launch their careers – 19 writers have received options and representation to date because of Max’s assistance and support. His Story Farm consulting service develops working writers and their material much like a studio executive or manager would, and his online classes, titled The Craft Course in Screenwriting, offer writers outside the Los Angeles area to take part in professional full development. A development consultant, manager, and screenwriting instructor, Max is a screenwriter and author himself. His debut novel, a young adult fantasy adventure titled The WishKeeper, about a teenage fairy with broken wings, won the young adult category of the 2015 Los Angeles Book Festival and released worldwide in the Summer of 2016. Max has also served as a part-time instructor at UCLA, and travels nationally and internationally speaking at a multitude of industry events such as the Sundance Film Festival, Nashville Writers Conference, and even educating art program teachers through the LA Unified School District. You can find out more about Max's Story Farm Development Coaching Service here. The Villain, Rival, Opponent - Whatever He's Called! How is this Character Related to the Secondary Character? Episode 1 of The Craft - Sequence 1 Breakdown - "We Need A Hero"
Episode 2 of The Craft - Sequence 2 Breakdown - "Setting It All Up"
Episode 3 of The Craft - Sequence 3 Breakdown - "The Unsung Hero"
Episode 6 of The Craft - "A Sidenote for the TV Writer"
The Difference Between "Adventure" & "Journey"
Episode 4 of The Craft - Sequence 4 Breakdown. "The Promise of the Premise"
Episode 5 of The Craft - Sequence 5 Breakdown. "Success, Failure & the Villain"
Episode 7 of The Craft - Sequence 6 Breakdown - "The Mid-Point"
Episode 8 of The Craft - Sequence 7 Breakdown - "The Doomed Honeymoon"
Episode 9 of The Craft - Sequence 8 Breakdown - "Love, Conflict, and Losing It"
Episode 11 of The Craft - Sequence 9 Breakdown - "The Dark Night of The Soul"
Episode 12 of The Craft - Sequences 10 & 11 Breakdown - "Why Hast Thou Forsaken Me?" Episode 14 of The Craft - Sequence 12 Breakdown - "It's Not About the Victory"
Answers: Where In The World Is Arthur? What Makes For Great Dialogue? Audio: What Makes For Great Dialogue? Assignment: Page Writing - Finally! What Now? And What Should You Expect? Episode 13 of The Craft - "A Note on Motivation - Is It All Worth It?" Week 9 - Script Deadline - Three Weeks from Today! Week 10 - Script Deadline - Two Weeks From Today! Week 11 - Script Deadline - Final Week! Using relevant examples and in-depth knowledge of the form and function of a screenplay, Max Timm takes a writer from the germ of an idea to a full script. Especially powerful is the way he breaks down a screenplay into organizational sequences. Overall, the course is accessible, understandable, and practical. I would encourage writers to try it. Add a Script Evaluation for consideration into the ISA Development Program!